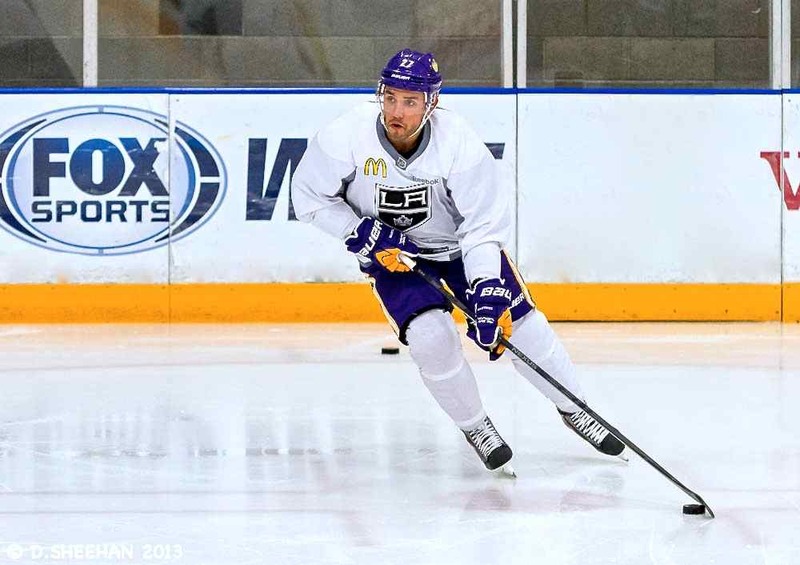 Los Angeles Kings defenseman Alec Martinez, shown here at a recent practice. EL SEGUNDO, CA — To say that defenseman Alec Martinez has struggled to secure a spot in the Los Angeles Kings lineup would be quite the understatement. In fact, staying in the lineup has been such a huge challenge for the 26-year-old, 6-1, 208-pound native of Rochester Hills, Michigan during his tenure with the Kings, that it just might be a candidate for David Letterman’s list of Top Ten Understatements, if such a list existed, of course. Looking back to the 2011-12 season, Martinez was in and out of the lineup at the start of the season while Terry Murray was the team’s head coach, and little changed once Darryl Sutter took over in late December. But by the time the Kings hoisted the Stanley Cup on June 11, 2012, Martinez had become a fixture on the Kings’ blue line, playing in all twenty playoff games. But during the abbreviated 2012-13 season, Martinez’ play dropped off—he was not the same player from the previous season’s run to a Stanley Cup Championship. Accordingly, he played in just 27 out of 48 regular season games, and in only seven playoff games. Little changed for Martinez to begin the 2013-14 season. He was a healthy scratch in the first three games of the season, and then played in the Kings’ next five games. But after that, he sat out the next seven games. At that point, injuries began to plague the team, and soon, defenseman Matt Greene would be lost to an upper body injury that landed him on injured reserve (retroactive to November 2, 2013). Suddenly, Martinez had an opportunity to play, and to make a strong, positive impression on the coaching staff. But a wrench was thrown into the mix, as he has had to play on the right side, not his natural left side, while paired with veteran, stay-at-home defenseman Willie Mitchell. Nevertheless, Martinez has been able to adapt. If you’ve paid attention to media coverage of the Kings since Mitchell joined the team, you know that he is one of the best players in an interview because he will not only talk with reporters, but he actually provides valuable detail, well beyond clichés, and when asked about his partner on the blue line, he did not disappoint. Mitchell has played with four different partners this season, but has already played more games with Martinez than his other partners. Mitchell also noted that Martinez seems to be enjoying playing on the right side. Head coach Darryl Sutter indicated that Martinez has done well on the right side, but he added that there is room for improvement. Sutter’s comments were certainly not the strong, enthusiastic vote of confidence, indicating that Martinez’ stock has risen in the eyes of the coaching staff. However, Sutter is generally reticent to praise his players in the media, so his words must be taken with several grains of salt. In any case, it does seem that Martinez still has not locked up one of the top six defenseman spots in the lineup, and with Greene skating again, he could return at any time, giving the Kings an extra defenseman, and a dilemma that could push Martinez out of the lineup once again. Nevertheless, the uncertainty can be frustrating for him, as it would be for any player. A player in Martinez’ position will usually say that he is a professional, so he has to deal with the frustration and not let it get the best of him. But players are human beings, and human nature dictates that every so often, that frustration is going to bubble up to the surface, and understandably so. How does a player handle that? At 36 years old, Mitchell is a grizzled veteran of twelve seasons in the National Hockey League. He has seen a lot over that time, and he understands what Martinez is going through, maybe better than Martinez does. Mitchell indicated that Martinez’ confidence may be on the rise. Mitchell also indicated that in the past, perhaps Martinez was trying too hard to make an impression. Going forward, Martinez seems to know that all he can do is work to improve his game, and do what the coaches expect of him. Everything else will take care of itself.